Alfa California 2013 is now officially closed. We've posted photos and results on new pages (right over there at the top of the menu bar). Take a look. We'll keep adding to these pages for a while. On our links page you will find pdfs of all of our self-guided tours. Check 'em out! We are looking for the next generation of AROC judges! If you are between 12 & 17 years old (or if you have a child that age) and want to try your hand at judging at the Concorso – we want you! 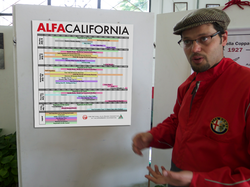 The Junior Judging program is designed to let you tag along with the AROC National Concours Chair and AlfaCalifornia’s Chief Judge to learn the protocol and finesse of judging Alfas. 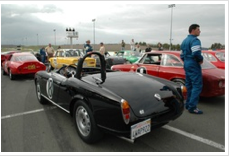 If you are interested, contact Tamara Williams, AlfaCalifornia’s Concorso Chair at tamara@dominoevents.com. Online registration closes July 1 at 11:59pm so we can settle all the registration data, print badges, etc. If you haven't registered yet, go now! Same if you want to add a few events. Add now! We’ve just added more seats on the Safari West Wildlife Park Tour! Safari West provides you with a glimpse of African wildlife. This hidden gem is home to hundreds of amazing creatures you've only seen on Animal Planet. If you were considering this tour, now's your chance. Go back into your registration and sign up today. We're proud to announce our online store is up and running. Take a look over there to the left! We've pulled the plug on the Post-Convention Midcoast Tour due to a lack of entries. Some AC13 events are sold out, some close to sold out - if you're considering adding events to your registration, don't wait! We've increased the number of cars that can participate in the Parade Laps to 120. If it is something you've been dying to do ... go back into your registration and sign up now, before it fills up! 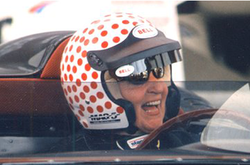 Our Hooked on Driving school/track day AND the Time Trial events are now open to non Alfas. See the link to the right to download the application. Tell a friend. We've been busy working on all the nuts and bolts of the convention. As you no doubt hear about every convention, we have some really special events planned, but really, it's true! And now today's lesson from your beloved mechanic Gian Paolo. Gian Paolo is a bit agitated. Note the hands moving too fast for the camera. It's a variation on Gian Paolo's normal exhortation: "you can pay me now, or you can pay me later." Instead, he's suggesting that you sign up NOW ("Subito! Non domani") for the events you want to attend at AC13. With so many people coming from all over the country he's worried you'll show up and find those key events you wanted will be sold out. That, and you're low on wiper fluid. Our registration website shows which events are sold out, which have a wait list and which are still open. Haven't signed up for the banquet yet? You can always add events even if you've already registered. Due to overwhelming demand we've increased capacity on three of our tours. Those previously on a waiting list for these events have first shot at the new spots. If you have already registered for AC13, would like to add one of these, but were not on a waiting list please email registration@alfacalifornia2013.com for your confirmation number so that you may re-enter the registration page to add these tours (or other great AC13 events).